When Port Gamble S’Klallam tribal member Shallee Baker grew up on the reservation, she didn’t have many mentors to teach her the tribe’s traditional practices. “I started thinking about other kids on the reservation who are in the same situation – either in foster care or maybe they just don’t have parents or resources to teach them their culture,” she said. In 2017, Baker, the tribe’s natural resources department education and outreach coordinator, started “Sustainable Little Boston – Traditional Sustainable Practices,” a series of classes where tribal members learn the practices of their culture from elders and traditional knowledge keepers, while protecting the environment like their ancestors. “It is vital that we keep our S’Klallam traditions alive by teaching our youth and community as a whole about how to harvest without damaging the environment, and in ways that will sustain our resources and culture over time,” Baker said. There have been 10 classes since 2017, covering topics including how to harvest cedar bark for traditional clothing and basketry, prepare and smoke salmon in a smokehouse, use nettles in cooking, and prepare a traditional seafood bake. 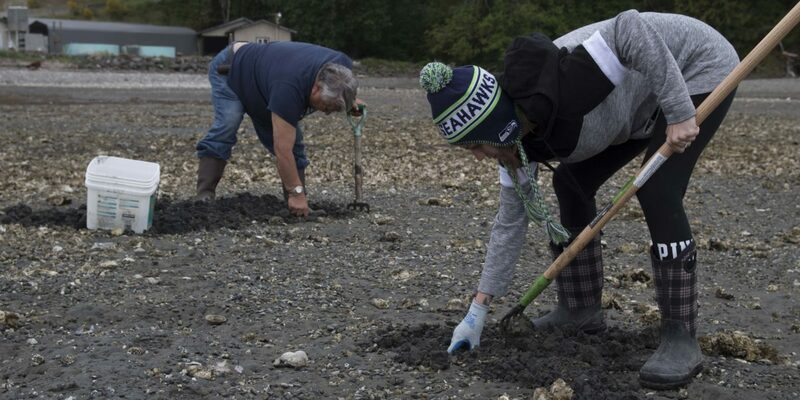 “We noticed there’s people who don’t know how to do the things we automatically assume, such as harvesting shellfish properly,” Baker said. For the seafood bake, tribal elder Gene Jones spent three days teaching students how to pick rocks for the fire (dark-colored ones so they don’t crack while hot); how to prepare ironwood branches for cooking fish and clams (make them 4 feet long and 1 inch thick); and how to dig for horse clams without damaging the meat (be a really, really fast digger). The classes are open to youth and adults of all ages. “To me, the variety of ages is special because with this kind of work, it not only protects our environment and our natural resources but it’s a rite of passage,” Baker said. Watch a video of the class here.